Today's article featuring a family affected by a rare disease brought a strange coincidence. 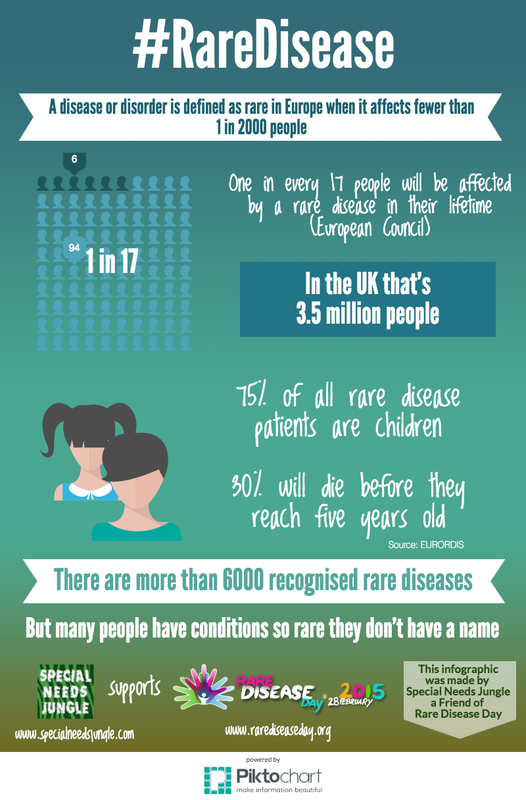 On Wednesday, when I was at the Rare Disease UK reception to mark the yearly Rare Disease Day, the reason for this series of articles, I found myself talking to a representative from Genzyme, a large pharmaceutical company. We were chatting about patient advocacy and I was telling him about our series (which has taken quite a lot of effort to pull together) when he mentioned a charity for people affected by the rare condition Tay Sachs. Dan Lewi, who runs The CATS Foundation had won Genzyme funding to create an app giving information about the condition. More info at the end. The coincidence is that they very same family are the focus of our Friday article today. Co-founders Dan Lewi and his wife Patricia Durao, like so many parent carers in impossible situations, took matters into their own hands to search for answers for this very rare condition that was threatening their precious daughter's life. Patricia has written, very powerfully, about their experiences. It will be four years in March since our daughter Amélie was diagnosed with a devastating genetic condition called Tay-Sachs, a neurodegenerative disease. It was passed on to Amélie by me and her father as we carry the same defective gene where a certain enzyme in the brain is not produced and this leads to progressive brain damage – this is my short version, the one I have learned to blurt out very quickly when people ask about Amélie and show immediate discomfort at the start of my revelation. There is no, “What to expect when you have a child with a Rare Disease” book. No one prepares you for the shock and the pain, the disbelief and anger that come with such a diagnosis. Suddenly you are throwing away all your “How to… your child” literature and unsubscribing from all the “milestone by week” websites. That is all in the past, a painful reminder that no one we already know can really tell us what to expect. We have been picked up from a “white picket fence” kind of life by hovercraft and been dropped at the Hunger Games Arena and the odds were certainly not in our favour! I first became aware of this when one of my friends, mother to a child of a similar age to Amélie consistently told me throughout our conversation “But it is VERY RARE!”. I was explaining that actually 1 in 300 people are Tay-Sachs carriers, and that we will know more people that are carriers, although unknowingly. I explained I had just found another family whose daughter was diagnosed at the same time as Amélie and we would find more. We wanted to do something about it. Her reply was her own reassurance. That was the moment I knew… I realised that our friendship and probably most of our relationships, would never be the same. We were inside that arena where everything is perilous, scary, a constant fight for survival from the unknown and she was outside, watching, not wanting to really understand how we got in there, not wanting to imagine it, feeling sorry for us and at the same time relieved that the odds were not against her… thinking that because the odds turned against us, they will, most likely not turn against her. She is probably right, and I hope she is! As relating to those around us became harder we instinctively started building our charity, The Cure & Action for Tay-Sachs (CATS) Foundation. There was already a glimmer of hope of a treatment for the disease in many years to come. There were other families, other children who were affected. There were people, like us, who needed to talk to someone who knew what it felt like to suddenly be the odd ones out. There was always very little chance that a treatment would be achieved in time for Amélie and this became a certainty only a few months after we launched The CATS Foundation in 2011. But this was not our only goal; this was not a race to save our own child. Of course we would like more than anything else in the world to save her, but it is just not possible and we, like many other parents that we met along the way, had to come to terms with it. I now know hundreds of parents of children affected by Tay-Sachs from all the four corners of the world. You do not become friends with every single parent who has a child with the same illness as yours. In fact, I must be honest and confess that there are a few that I quite dislike. But this is good. This gives the friendships that I did forge, some that I believe will be lifelong, a true meaning. We discuss the symptoms, we share tricks and we even share jokes, just like the parents on the “outside” do. We don’t pity each other, we have learned, the hard way, the true meaning of compassion and empathy. We know how hard it is to get out of bed sometimes, that those nights when the children sleep through the night bring, for an instance, the worst fear! We understand that we are not always going to be texting, posting, replying to messages or sending gifts at the right time. We have friends who have lost their children, we have the words to comfort them and try our best to show them love, knowing all too well that, someday sooner or later we will be in their position. We know that on the other side of the friendship there is a parent who would rather have been split in two by an axe than to be in this situation. Parents like us have to fight every day for their child’s comfort. The specialists had told us that we would become the experts on Amélie’s disease, and this is true. We spent the last four years learning, reading and discussing symptoms with other parents and health practitioners. We usually find the source of new symptoms; we find ways to improve them. I know this is true for all my fellow parents who have the same struggles. And still, we fight together! I am writing this blog entry for Rare Disease Day with very little sleep on me, we have changed our careers, our lifestyle and our aspirations because we want to change the world a little. I want to tell my friend and all the parents on the “outside” that the last thing parents like me want is for you to walk in our shoes, but we do not want to be branded “unlucky”. 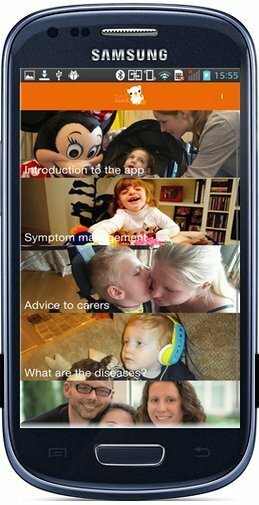 Introducing the eAcademy for Tay-Sachs & Sandhoff Disease app! In 2014 The CATS Foundation was one of the Genzyme Patient Advocacy Leadership (PAL) Award winners. The charity was awarded a grant of $15,000 to create an app for smartphones and tablets which is aimed at providing caregivers of individuals with Tay-Sachs and Sandhoff information on the diseases, symptom management and many other subjects. We are delighted to announce that to coincide with Rare Disease Day on the 28th February 2015 The Cure & Action for Tay-Sachs (CATS) Foundation is launching the eAcademy for Tay-Sachs and Sandhoff Disease app which we have designed and is ready for download!